Ramco HCM offers Comprehensive Time and Attendance integrated with Core HR and Global Payroll (35+ Countries) on a unified platform. 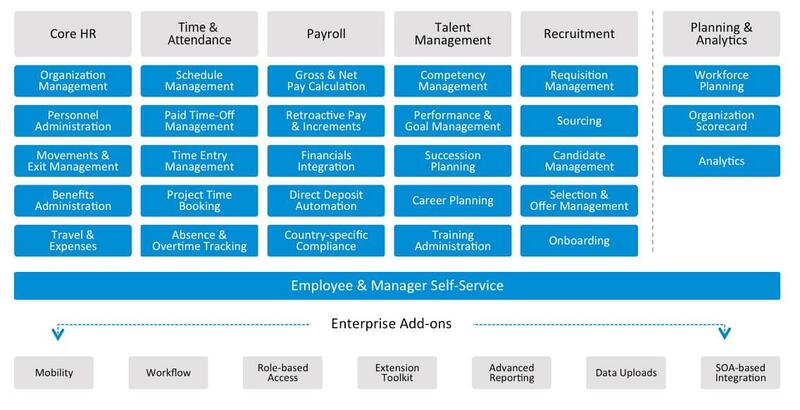 Ramco HCM enables organizations to simplify their HR strategy through a unified HR software from hire to retire. Ramco provides a comprehensive Time & Attendance software that helps automating employee schedule/ shift management, attendance tracking and shift compensations. It also offers Geo-tagging: NFC and GPS based attendance tracking through mobile, integration with Global payroll & Core HR on a unified platform, use of chat bots & email for Employee Self Service (ESS). Ramco HCM is scalable and can be deployed on cloud or on-premise. It supports integration with most of the existing ERP, HR, Financial business applications. Ramco HCM-Time and Attendance is ideal for any organization who are ready to embrace Digital HR to transform their operations. Ramco HCM-Time & Attendance caters to medium and large enterprises – 100+ to 100000+ employees. Ramco is a fast growing cloud enterprise software player across HCM & Global Payroll, Time and Attendance, ERP, Logistics, Asset Management and Aviation MRO. Still not convinced Ramco HCM Time and Attendance is right for you? Use our Product Selection tool to browse additional HR software solutions and get a custom recommendation. Have questions? Call, click, or email to get a free consultation from one of our unbiased Technology Advisors. Learn everything you need to know about Ramco HCM – Time and Attendance. Our experts will reach out to you shortly.